My name is Topher Brown Suga Maurer. 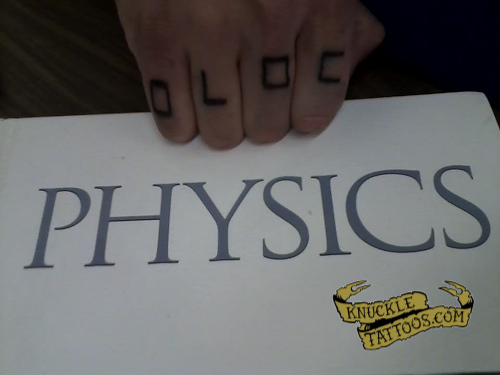 I just got OLOC on my right nucks. It stands for One Life One Chance. I am a manic depressive and I have been super down lately as well as making some bad choices, decided it was time to get myself under control and turn things around. I have a degree in physics so I took the pic for fun. lol. 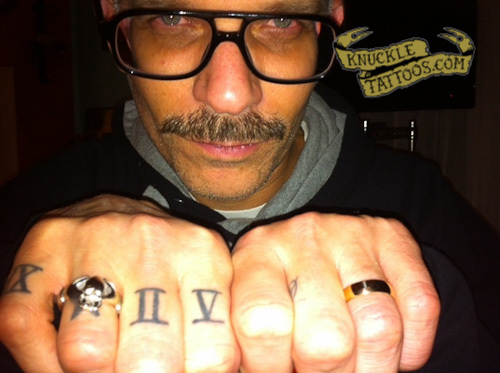 I have other tattoo’s but I have been wanting knuckle tatts for a while now. Got this done when I was 18 with needle and thread in my buddys garage after a long night of partying and im 23 now thinking bout gettin somthing else put over it but I’m not sure and thats how I came across this website. My name is Christie and I had “LEFT” tattooed on my hand so I wouldn’t forget. Hello , my name is Mike and I own a tattooshop in Belgium. Recently a friend/client of mine made this tattoo. BEUS. According to him it means : When someone gets to close , its the sound that people will hear when his fist makes contact with their face. basically my story is i’m a huge paramore fan, and their album riot! saved me from myself millions of times, and got me through things in my life i couldnt even imagine. Names Goober.. I was trying to think of something funny that no one else had ever had or I have ever seen . Im always hearing peolle say there gonna give someone a knuckle sandwhich so I thought how funny would it be to put an actually ham and swiss cheese sandwhich on my knuckles.. And here you go..